At Diversitec, we strive to meet or exceed your daily business performance expectations. Contact us and you'll receive batteries ready for immediate installation – voltage and battery test dates are noted on the top of every battery. No power system is safe from Mother Nature… that’s why battery backup systems are critical to your system users. With the explosive growth within the communications field, maintenance of your infrastructure and backup systems is critical. In order to help fulfill your needs with batteries, Diversitec supports a full line and a wide range of batteries for our customer base. Batteries are maintained, trickle charged and safely packed and shipped to national locations daily. Batteries you receive will be ready for immediate installation – voltage and battery test dates are noted on the top of every battery. 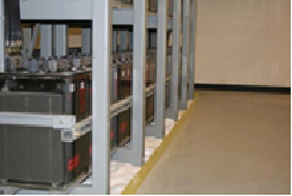 We also offer virtual warehousing services for batteries. These services include full shipping, receiving, storage and charging capabilities. 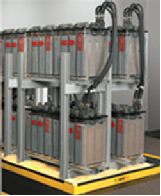 East Penn Manufacturing is the largest single site battery manufacturer in the world. Since 1946, East Penn has been manufacturing high quality Deka Batteries. The complete line of Deka stationary batteries by East Penn provides dependable, reliable power for a wide variety of applications including Telecommunications, Uninterruptible Power Supplies (UPS), Utility, Oil & Gas, Emergency Standby Applications and many others. Power Range: 30 to 2000 Amp Hours. NorthStar is a global leader in designing, manufacturing and deploying an innovative range of batteries and power solutions. The company was established in 2000 by a group of experts in the lead-acid battery industry, who together hold more than 100 years of experience. NorthStar products are so reliable and cost effective they are used in more than 120 countries. NorthStar employs over 500 people worldwide, with headquarters in Sweden and major operations in the USA and China. NorthStar also has global distribution and service centers, which include Panama, Indonesia, Dubai and Singapore. Over 100 years old and focus remains in the Telecommunications and Data Transmission arenas. They offer a wide range of technologies; from Flooded to VRLA to Spill containment solutions. C&D Technologies, Inc. is a global leader in solutions and services for the switchgear and control (Utility), telecommunications, and uninterruptible power supply (UPS) applications. C&D Technologies engineers, manufactures, sells and services standby batteries for regulating and monitoring power flow and providing backup power in the event of primary power loss until the primary source can be restored. C&D Technologies is headquartered in Blue Bell, PA.
HAZE Battery Company was born of a mixture of Western technology and Eastern work ethic, Western quality concepts with Asian cost effectiveness. The company's products cover a full range of 2, 4, 6 and 12 Volt VRLA Batteries in Absorbed Glass Mat (AGM) and Gelled Electrolyte. The company philosophy is to focus on the actual and implied needs of the customer, supplier, the employees and the environment. Our ever expanding product range provides the solutions to the ever-changing requirements of the market place. A design service can provide cost effective tooling for customers individual requirements, resulting in the market advantage our customers need to develop their own business. EnerSys, the global leader in stored energy solutions for industrial applications, manufactures and distributes reserve power and motive power batteries, battery chargers, power equipment, battery accessories and outdoor equipment enclosure solutions to customers worldwide. Motive power batteries and chargers are utilized in electric forklift trucks and other commercial electric powered vehicles. Reserve power batteries are used in the telecommunication and utility industries, uninterruptible power supplies and numerous applications requiring stored energy solutions including medical, aerospace and defense systems. Outdoor equipment enclosure products are utilized in the telecommunication, cable, utility and transportation industries and by government and defense customers. The company also provides aftermarket and customer support services to its customers from over 100 countries through its sales and manufacturing locations around the world. Get all your spill challenges solved with our full range of Spill Containment Solutions. From absorbents and neutralizers to full self-contained Spill Kits, you can rest assured we can solve your problems. All of our spill products meet or exceed EPA and UFC standards, and represent some of the best technology the industry has to offer. Copyright © 2019 Diversitec, Inc. | All rights reserved.